Christmas displays is what we built our business on and although we have grown and introduced other divisions over the years, Christmas still remains a large part of our company and something we take great pride in. We already offer a wide variety of stock displays, but we always look forward to designing and creating new displays to add to our roster, and this year was no different. For the 2013 season we wanted to design displays that were less Christmas specific. As vibrant and festive as Christmas displays are there is a downside to the short time period that they can be used. That’s why we wanted to offer our customers something that can be used for the entire winter season, something that gives them more bang for their buck. With that in mind we focused on something that winter is rarely without, snow. Working with our design team, a number of different styles of snowflakes were drawn up and six were chosen to be manufactured. Ranging in price, with some looking more traditional, while others are more modern, we are very pleased with how they turned out and extremely excited to unveil them to all of our customers! Manufactured with a steel frame that is fully immersed in zinc and electrostatically plated for maximum rust protection and lit with ½” energy efficient LED rope light, the Snow Blossom, Snow Crystal, Snow Diamond, Snow Swirl, Snow Flurry or Snow Spear would beautifully enhance any city street or property. 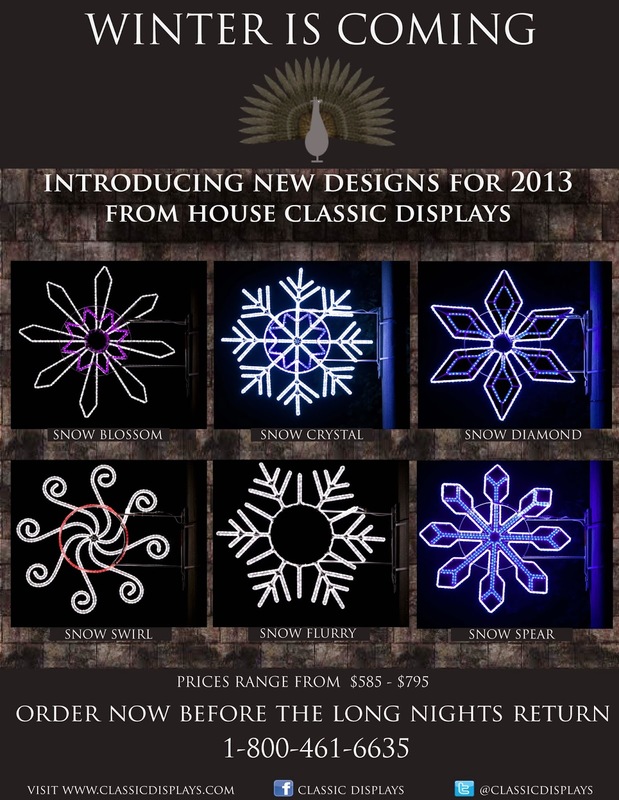 With the option to have the displays pole mounted or wall mounted and the ability to customize them through the use of different rope light colours, we are confident our snowflakes will become a fan favourite!